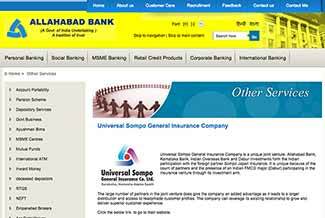 Allahabad Bank plans to sell all or part of its stake in insurance joint venture Universal Sompo General Insurance Co. Ltd, the state-run lender said. The bank is the largest shareholder in the insurance firm with a 30 per cent stake. Japan's Sompo Japan Nipponkoa Insurance Inc has a 26 per cent stake in the JV, while state-run Indian Overseas Bank owns 19 per cent, Karnataka Bank 15 per cent and consumer goods company Dabur 10 per cent. In a stock market disclosure, Allahabad Bank said its board will meet on December 4 to consider the stake sale proposal. The board will also consider appointing a consultant to advise on redrafting of the shareholders agreement. Recently, British health insurer Bupa Plc agreed to increase its stake in its Indian health joint venture with Max India Ltd to 49 per cent from 26 per cent for about Rs 191 crore ($29 million). Max India, led by chairman Analjit Singh, said its stake in Max Bupa Health Insurance will fall to 51 per cent from 74 per cent. In September, Japan's Nippon Life said it would raise its stake in Reliance Life Insurance while Australian insurer QBE Group said it would buy more in Raheja QBE Geneeral Insurance Company Ltd.
Japan's Tokyo Marine said it had sought to raise its holding in Edelweiss Tokio Life Insurance from 26 per cent to 49 per cent and Axa hiked its stake in Bharti Axa. Australia's Insurance Australia Group Ltd has also said it would increase its stake in a general insurance joint venture with India’s largest lender, State Bank of India, to 49 per cent.